It’s been an odd off season in MLS. Unlike years past where there was a definite lull in the amount of stories and headlines coming out of the league during the winter months leading up to the season, there was a near constant flow of announcements this time around. From Toronto FC’s seismic signings to a twin pair of expansion announcements in Florida, the league taking over a troubled franchise in LA and now preseason friendlies over the last fortnight, it’s just been non-stop. So with this being the final week before First Kick 2014, that’s meant it was time for the league-mandated kit reveals to fill up our newsfeeds as well. And that, of course, means it’s time too for me to give you the second edition of my reviews of each of the new shirts dropped around MLS. Looking back at last year’s review, I noticed a few points of interest. First, I was incredibly harsh in my reviews of some of the shirts. Some of the shirts I gave poor marks to grew on me over the season, though a few still fail to impress. Secondly, the actual club reveal events were often the first time we had seen a majority of the 2014 2Jersey Week reveals. This year, that’s a completely different story. Of the full nineteen MLS clubs dropping at least one new shirt for the 2014 season, sixteen’s shirts had were leaked before their planned release dates. And though I’ve had an extra full week to form my opinions about how they look this year, I didn’t get the explanation for some of their design decisions ahead of time — not to mention the high resolution pictures needed to truly judge the kits. So I wanted to give the clubs/adidas a chance to explain themselves before I ran them through the ringer. Though I said I’d go easier on my kit ratings this year, how is it that I give a C right out of the gates? For the new away shirt for the Dynamo, it boils down to the lack of change from last year’s 2013 secondary shirt. The orange sleeve panels have made way for an extra stripe of light blue piping at the cuff. A slightly revamped collar also makes an appearance, as does a “lenticular” — or 3D — crest. Overall, there’s nothing wrong with the shirt itself; it just isn’t enough of a change to earn them a better grade. That said, praise should be handed out for the new kit’s stellar hooped socks. In a lesson that the US soccer federation hasn’t quite learned yet, the Galaxy have wisely stuck with their sashed shirt design. And this year’s striped sash is particularly pleasing. The eleven stripes — meant to represent the XI on the pitch — taper to give the shirt a feeling of positive, upward movement. Plus, the over used “quasar” effect from last year’s shirt designs has been minimized and moved to the inner neck taping, leaving us with a much more clean design. Easily one of my favorites of the bunch. For the second year running, the club that Paulson runs dropped two new designs. In fact, Merritt even leaked some teasers of the shirts a few months back over social media — naughty naughty. The secondary kit gets an overhaul just a year after the last refresh, with a two tone, red-to-black gradient design. A closer look shows that a tiny rose-thorn pattern is interlaced in the shirt’s fade and a secondary rose-shaped logo for the jock tag pay subtle hommage to the “Rose City” moniker. But the real gem is the new third kit. 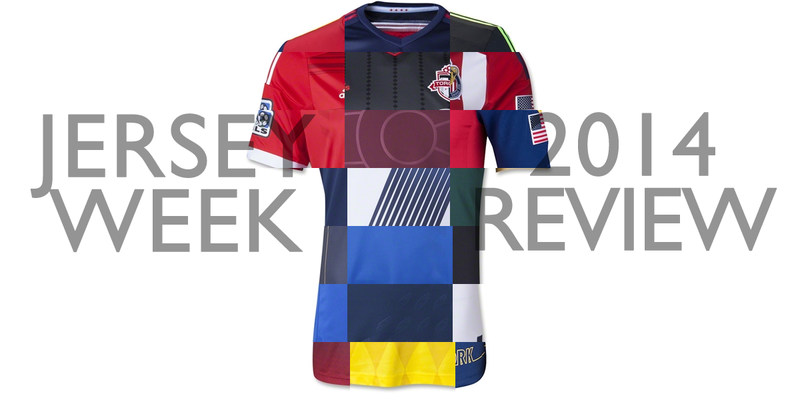 An excellent, modernized throwback that hearkens to the team’s NASL days. Classic colors, clean lines, and a simplified logo help this shirt to ooze retro cool. Bonus marks to the Timbers for including smart little infographics explaining the designs of each shirt. Ever attempting to be at the bleeding edge of MLS branding/marketing/identity, Seattle were the only team to give their new shirt a name: Pitch Black. Admittedly, the black pairs well with the accenting “radiant green” and makes for a strong, bold look. So why not a higher grade? While a good look, there’s just nothing that imaginative about it outside of slick, marketing-friendly color names. Not only that, but it’s not too different from their current second kit. I’m also a bit disappointed they chose to use the radiant green instead of black as the primary colors for the shorts and socks… but who would the Sounders be if they weren’t trying to burn our retinas while watching on TV? Jersey Week 2013 Did not participate. Poor Chicago. Not only were they deprived of a shirt launch during Jersey Week 2013, the long wait for a new home kit this year sees them launch probably the worst one of the bunch. And it earns that distinction for a number of reasons. Firstly, the Fire have a strong traditional design with a red shirt with a white bar across the chest, which has now been ignored two home kits in a row. Instead, the club/adidas chose to build upon the last shirts’s blatant betrayal of the white bar by turning it blue and extending it over the entire top third of the 2014 edition. Secondly, the Fire attempted to explain that the look is a nod to the city’s fire engine’s, but the color scheme is off. If you ask me, it actually looks as if the color template was more of a nod to their sponsor. Another side that didn’t participate in last year’s Jersey Week fun, the Crew decided to add a new primary shirt for 2014. And while it won’t wow you, it’s still a decent enough shirt, even if very basic. The black bands on the sleeves is an odd choice, as it could either make sure everybody on the pitch looks like the captain and/or like a permanent memorial band. That said, the fading diamonds screened into the bottom half of the shirt provide a subtle Bavarian feel to the shirt, which is fitting considering Columbus’ Germanic heritage. But the lack of jock tag or special monikers does hint at the fact that this is simply a holdover shirt until the Crew get their brand makeover in 2015. Much like Seattle and Columbus before it, the new Impact home shirt’s mark took a hit due to a relatively reserved and simple design. However, just like those other shirts, the subtle changes to this year’s shirt are enough to keep them from receiving poor marks. The former home jersey had about 8 million fleur-de-lis screens all over the front of it, with the Mont-Royal cross formed in the negative space in their absence. This year’s shirt flips the script, minimizing the use of the fleur-de-lis screenings to center the cross upon the club crest to much greater effect. I’m not going to go on and on about another simple jersey design, so know why the Red Bulls’ newest away shirt started off with a lower grade. And just like the Revs’ shirt above, it takes a further knock for featuring an extraordinarily large sponsor logo on the chest. But the one redeeming quality of the shirt is the is the unique “New York” line font jock tag strip along the bottom edge of front. Though the larger “New York” on the back does reek a little of insecurity ahead of neighbors NYCFC joining next season. Simplification that actually improves the design makes its return to Jersey Week. The Union dropped a lot of the light blue accents that had been a feature on the last home jersey in favor of a more basic and clean gold and navy template. And while it may seem rather mundane from the front, when you see the shirt flipped around you’ll see the true beauty of the upgrade… pinstripes. Those pinstripes inconspicuously wrap around the front of the shirt forming the two thin stripes that border the larger central one, though you would never be able to tell from looking straight on. Bonus points for sticking with the same theme the club have rocked since it’s inception. One of the few shirts to not actually leak out ahead of Jersey Week was Real Salt Lake’s new primary shirt. It’s a familiar look for RSL, what with their standard claret body and blue sleeves. But the addition of what the call a “gold crown bar” streaking across the chest provides an element of interest. It’s an odd design that I originally didn’t like, but it’s grown on me a little. Though I still feel like this would have made a better training top instead of an actual kit. If nothing else, it provides a completely different look to anything else currently gracing pitches across the league. 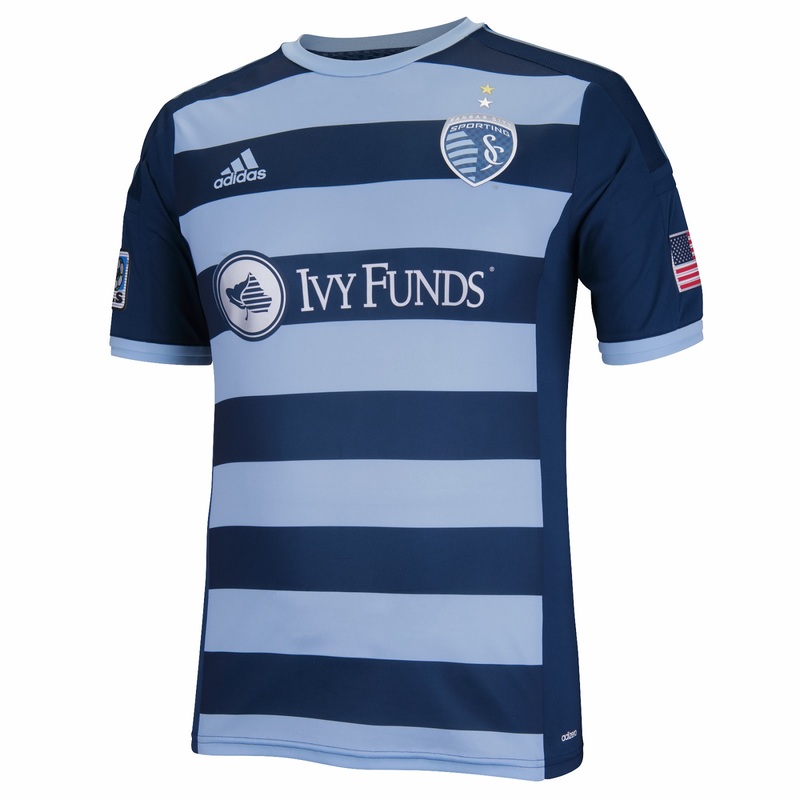 The other shirt that didn’t leak out ahead of the big announcement was Sporting KC’s new secondary shirt. And I must say, the reigning MLS Cup champs picked an excellent shirt to drop… and probably my favorite new shirt over all. A hooped design alternating between navy and sky blue is the primary feature of the shirt, although the club will be keen to point out the new silver star above the crest representing their latest Cup triumph. The Rapids opted to replace the new home shirt they debuted last year — a slightly hooped variant that composed of season ticket holder names which I really liked — and simplified it like many other MLS teams have this year. But, taking a page from the third kit dropped at last year’s Jersey Week launch, the home kit now also features a screened “C” design that pays homage to the state flag of Colorado. That flag itself is emblazoned on the bottom of the shirt at the jock tag. And, honestly, it really helps to tie the entire kit line together. A basic, unoriginal shirt design point deduction not withstanding, I have to give credit to the Whitecaps for opting to use screened logos on the shirt to create a wave effect. But while the concept of paying tribute to Vancouver’s surrounding ocean in that way sounds really cool, in execution it just doesn’t look as great as it sounded. Though I will admit the addition of a more silver accent color to the kits’ three stripes and logos does help to add a more classy look to the shirt. Another shirt that’s grown on me since it originally leaked out is FC Dallas’ new home shirt. Gone are the familiar, distinctive red and white hoops that have given the team their nickname. In their place, subtle dark red hoops of various widths contrast with the traditional bright red — lending the shirt a bit of a Southwest vibe that fits right at home in Texas. The reason for the all-red makeover? The club are literally trying to “own the color red” in the Dallas-Ft. Worth area with their new club slogan “Red for 90”. A bit corny, but the shirt isn’t so bad. Full disclosure: I’m a sucker for grey kits, and this shirt is no different. Featuring a shade the club are calling “onyx”, the design is accented by 9 rows of increasingly spaced maple leafs to call out the dominant design that’s featured on the epileptic-inducing home shirt debuted last season. If this weren’t the Crew’s Trillium Cup rivals, I’d be tempted to shell out for this. That said, if this had been in any other color, I’m not so sure I would find it quite as appealing. Forever the afterthought and again without a special event to unveil their newest shirt. And with the club recently taken over by the league and due for a complete rebranding in 2015, it’s not really that surprising that this year’s home shirt is pretty much a “meh”. Red and white stripes, navy collar. And though there’s nothing particularly great or bad about this shirt — hence the grade — the shirt could prove a collectors item given it’s the last ever Chivas USA kit in MLS history. HEY… AREN’T WE MISSING A FEW TEAMS? Right you are, eagle-eyed reader. The reason for that? Two sides actually jumped the gun in releasing their 2014 kits. The nerve. Anyway, it’s only fair that I judge them now as well. Dropped way back on January 31st for the club’s 40th anniversary celebration and new brand unveiling, the Earthquakes were justifiably the first club to reveal their new kits for 2014. According to the press release, the shirts are meant to “reunite” the histories of clubs several eras. The red away shirt is aims to link the club to it’s NASL days, while the blue with black sleeves recalls the club’s initial rebirth in the MLS era. While I like both concepts, the fault-line inspired screened design is used so much that I’m literally looking at it in the middle of an earthquake. It just comes off a little overboard. I’ve said it a thousand times already in this article, and I’ll say it again with D.C. United’s newest kit. There’s practically zero customization aside from a nifty, tire tread-esque United eagle on the jock tag. If you took the club’s raised crest off the shirt, this wouldn’t look any different than a kit your own team could order to wear in your Sunday League. Yes, I’m aware they club’s tradition features predominantly black shirts, but you would have to think they could do something to make this shirt a bit more interesting. So, what shirt do you like best? Disagree with any of the grades I dolled out to the new shirts? Be sure to let me know in the comments below, or hit me up on Twitter or Facebook. Huh… I hadn’t seen that one. I’ve corrected the article.